6 Line IP phone, 240x120 LCD, 21 Program keys/BLF/XML/PoE/HDV/EHS support/Dual Gigabit Ports. Power Adapter optional. 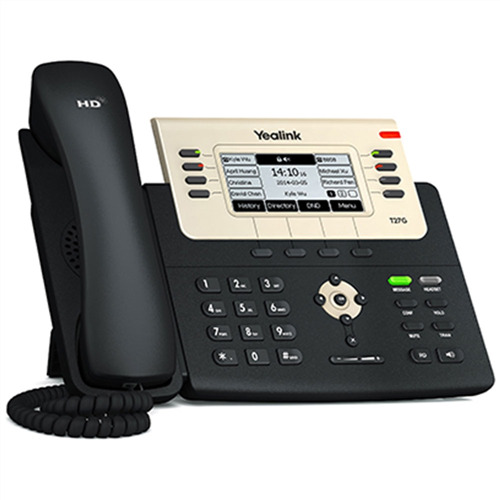 With faster response on the phone’s user interface and better device performance, the SIP-T27G IP phone, as the upgraded product of T27P, is Yealink’s latest feature-rich tool unifying superior voice capabilities and increased function extension capability for business. Yealink Optima HD technology and wideband codec of Opus deliver a superb sound quality and bring you a life-like voice communications. With an all-new USB port, the SIP-T27G boasts unparalleled functionality and expansibility, which comes ready for future Bluetooth, Wi-Fi and USB recording features. Seamlessly migrated to GigE-based network infrastructure, SIP-T27G IP phone is also built with the Gigabit Ethernet facilitating very rapidly call handling. By using standard encryption protocols, the SIP-T27G performs highly secure remote provisioning and software upgrades.